We’re on our way home. 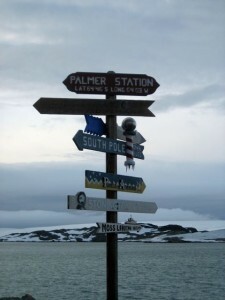 A week ago the Gould arrived at Palmer Station and we were reunited with Dave, Ari and the rest of the Palmer LTER crew. We spent a frenzied day packing and trying to conduct some final field sampling. 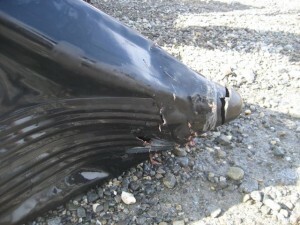 Then on last Tuesday we started the long, slow, six-day trip north to Punta Arenas, Chile. We finally arrived yesterday evening, after limping through the Drake Passage on one engine. Last night we came to shore and feasted on green, leafy salads, after being without fresh produce for the last couple of weeks of the trip. 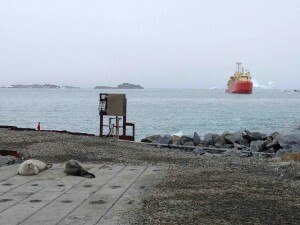 Two crabeater seals welcome the LM Gould to Palmer Station. Photo by Andy Read. Our plans for the final couple of days of sampling at Palmer Station were interrupted when we discovered that a leopard seal had bitten through the pontoon of our Zodiac while it was moored to the dock and destroyed the boat. I know that sounds crazy, but it happens in the Antarctic. Fortunately, we were able to use another boat and get out to collect a few last biopsy samples. Now that we are back on solid land we can start to reflect on our first field season as part of the Palmer LTER project. We deployed 8 satellite tags, collected 99 biopsy samples and obtained more than one hundred fluke photos from humpback whales. And, yes, we tried really, really hard to get that hundredth biopsy sample last week. We also mapped krill, collected poop samples from humpback whales and crabeater seals, and conducted one of the first aerial surveys of whales along the Antarctic Peninsula. All in all, we’ve had a tremendous field season. 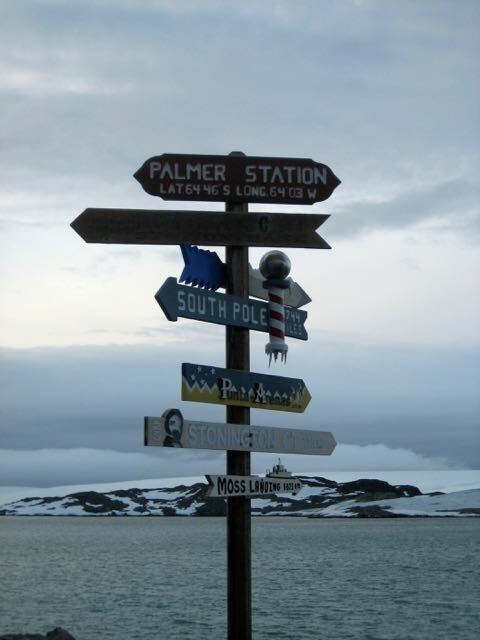 Palmer Station is a long way from everywhere… Photo by Andy Read. 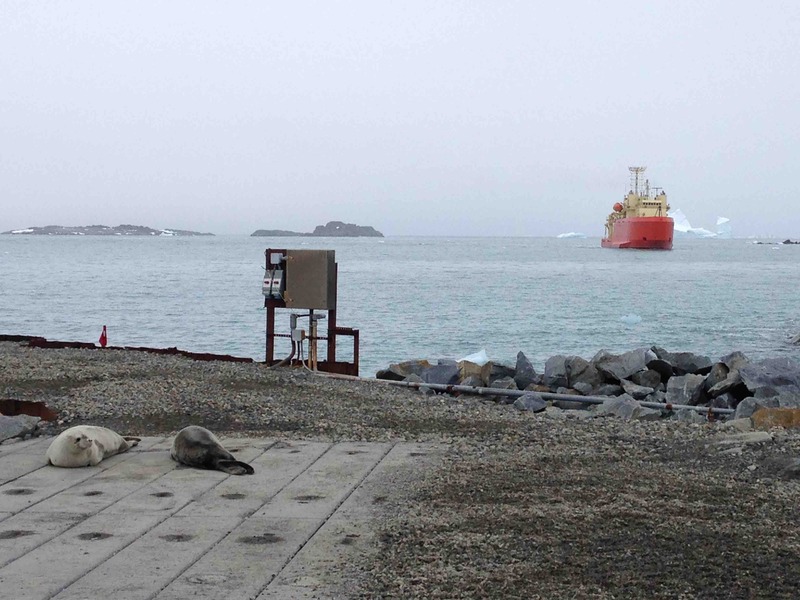 We’d like to thank all of our colleagues in the Palmer LTER project, the staff of Palmer Station, especially Rosemary McGuire, our boating coordinator, and the officers and crew of the LM Gould for keeping us safe and productive. It’s been a wonderful experience and I hope that you have enjoyed following along. See you soon in Beaufort or Durham.